The fossil remains of the highly publicized “ape-men” provide one of the most powerful arguments against human evolution. A look at some simple facts concerning these creatures (facts admitted by the most ardent evolutionists) is quite telling. Neanderthal skull at La Chapelle-Aux-Saints. Neanderthal was discovered in the Neander Valley of Germany, in 1856. Shortly after its discovery, University of Berlin Professor Rudolf Virchow (regarded as the father of modern pathology) concluded that Neanderthal was simply an unfortunate Homo sapiens who had suffered childhood rickets and adult arthritis, and had been victim of several nasty blows to the head. Depicted in textbooks and museums as a sub-human “ape-man” for over a century, it is now agreed that Rudolf Virchow was correct. The Neanderthals were simply a distinctive, sturdily built people group, clearly 100 percent human, with a brain capacity actually larger than the current norm. Some Neanderthal individuals suffered from disfiguring diseases, reflecting dietary, social and environmental factors, as with modern man. Erik Trinkhaus, an expert on the subject of the Neanderthals and also an evolutionist, has admitted that, detailed comparisons of Neanderthal skeletal remains with those of modern humans have shown that there is nothing in Neanderthal anatomy that conclusively indicates locomotor, manipulative, intellectual, or linguistic abilities inferior to those of modern humans. 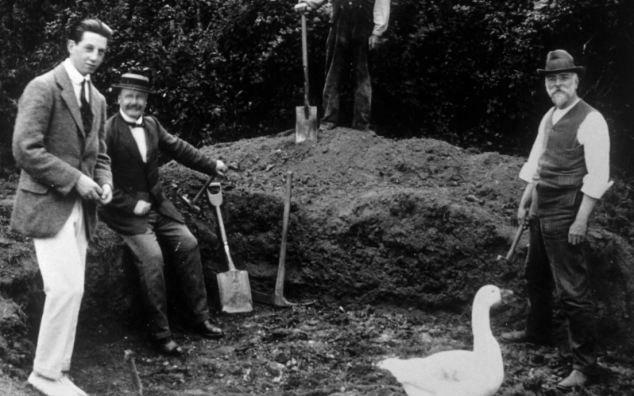 Excavation: Charles Dawson (sitting) poses at the Piltdown Gravel pit in 1913 alongside Robert Kenwood Jr. (left), Arthur Smith Woodworth (right) & “Chipper” the goose. 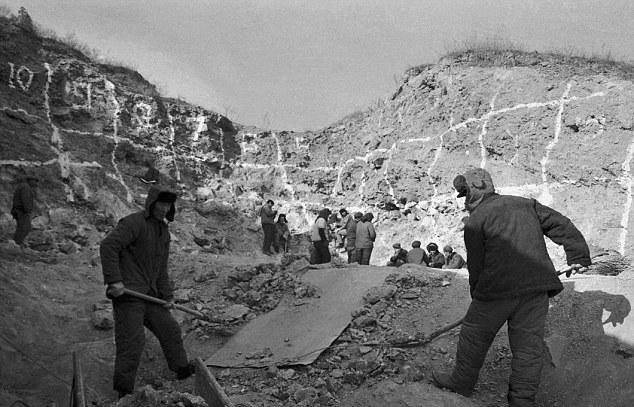 The Piltdown fossils were discovered between 1908 and 1915, at gravel pits in Piltdown, England. For the next 40 years or so, evolutionists used this fossil as one of their supposedly strongest pieces of evidence. Piltdown Man was highly publicized as proof that man had descended from “ape-like” animals. In fact, it was an elaborate hoax, and in 1953 the British Museum issued a statement identifying it as such. What was found were a skull that was obviously “human-like”, and a jaw-bone that looked very “ape-like” but had “human-like” teeth. In fact, Piltdown Man consisted of a human skull mated with the mandible (lower jaw) and canine tooth of an orangutan (confirmed biochemically in 1982). The orangutan remains had been heavily altered and transplanted to the site. The deception included breaking off parts of the mandible that would reveal the mismatch, coloring it with stain to match the skull, filing the teeth of the mandible to match those of the human upper jaw, and filing the canine tooth to make it look properly worn. The “Nebraska Man” tooth from Gregory & Hellman (1923). Leading evolutionists of the day touted Nebraska Man as a genuine “ape-man”, including Henry F. Osborn (head paleontologist) at the American Museum of Natural History, in New York. 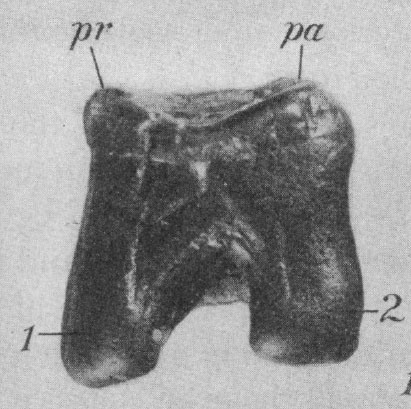 In February 1922, Dr. Osborn received a single fossil tooth, discovered at Snake Creek, Nebraska. A full reconstruction was commissioned, based on nothing more than this tooth and the desire to produce “evidence” of human evolution. Soon, widespread illustrations of an “ape-like” sub-human appeared, often in news papers. But almost as quickly, the publicity became a big embarrassment. By 1927, it came out that later excavations of the rest of the remains revealed the true identity of Nebraska Man: Not an “ape-man”, or even an ape but an extinct peccary or wild pig. Then, in 1972, it was discovered that, in fact, “Nebraska Pig” is not even extinct, but can be found alive and well in Paraguay. This attempt by evolutionists to reconstruct a living thing on the basis of a single tooth is a striking instance of how biased and misleading they can be when it comes to defending and imposing their theories. The syntype fossils of “Java Man” at Naturalis, Leiden. 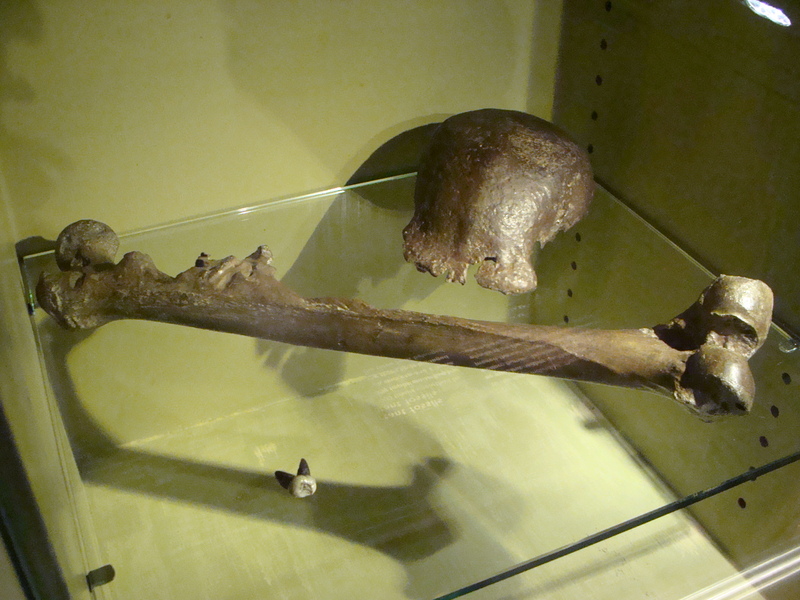 Java Man was discovered by a dutch anatomist, Eugene Dubois, on the island of Java. A skull-cap and three teeth were found in 1891, and in 1892, a femur (thigh-bone) was found 46 feet away. Eugene Dubois held that the skull-cap had both, human and ape features, whereas the thigh-bone appeared very “human-like”. Dubois claimed until his death that he had found “the real missing link”, his purpose in journeying to the Dutch East Indies. The doctor was not completely forthright, however he also found two obviously human skulls (known as the Wadjak Skulls) near the Java Man remains, at about the same level. He kept them secret for thirty years (until 1920), while promoting Java Man as the missing link. Obviously, Java Man could not be the evolutionary ancestor of humans with whom it co-existed. While the shape of the skull would be unusual today, it falls within the range of human variability. 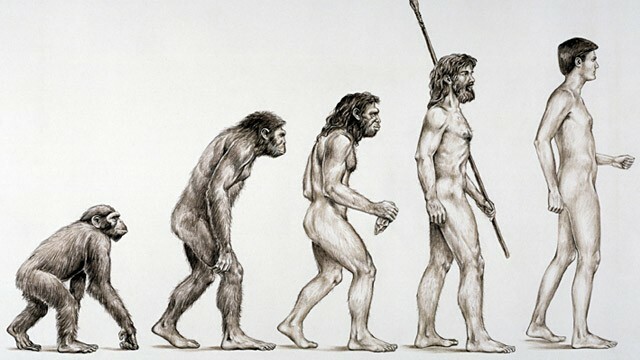 Java Man is now classified as “Homo erectus”, meaning upright-walking human. Thus, even evolutionists agree that these fossils are human – not an “ape-man”. The famous “Peking Man” skull went missing in 1941 when it was being transported to the U.S. from China during WW2. Peking Man was discovered in China, in the 1920’s and 1930’s and like Java Man has been renamed “Homo erectus”. The fossils, found about 25 miles from Peking (Beijing), consisted mostly of skull fragments (only five skulls were intact enough to gauge the brain capacity) and teeth, with very few limb bones. All of the original bones were “mysteriously” lost between 1941 and 1945. (Fortunetely, some excellent casts of the originals were made before their disappearance). Peking Man was a bit smaller overall than the average human today, but in all respect falls within the modern range of variation, and its middle ear structure has been found to be just like ours. As with Java Man, much of the truth surrounding Peking Man was kept from the public, while evolutionists acclaimed it as a “missing link”. At the site were also found the remains of ten fully human inhabitants who quarried the limestone, built fires, and left behind a variety of tools. It seems that (far from being the ancestor of modern man), Peking Man was not only a contemporary, but may also have been his dinner. The evidence suggests that the larger people removed (and very possibly ate) the brains of the smaller Peking Man individuals. In 1939, however, two experts, Ralph von Koenigswald and Franz Weidenreich, revealed that both (Peking Man & Java Man) were actually normal human beings. And Ernst Mayr from Harvard University had classified both as human in 1944. 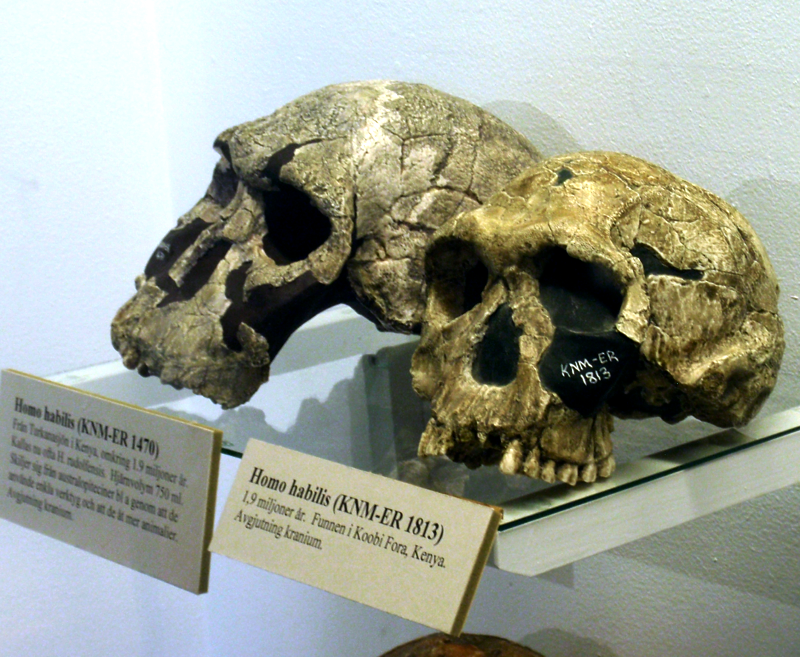 Skull “KNM-ER 1470”, Homo habilis (or Homo rudolfensis) on the left. 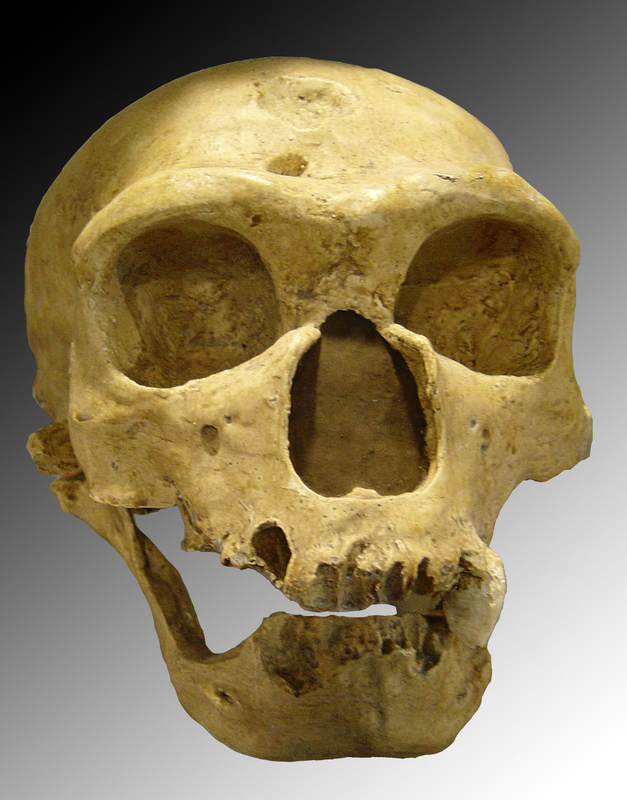 In 1964, Louis Leakey and his colleagues announced “Homo habilis” as a new human ancestor. Four “individuals” had been assembled from dissociated skull fragments, hand bones and foot bones. 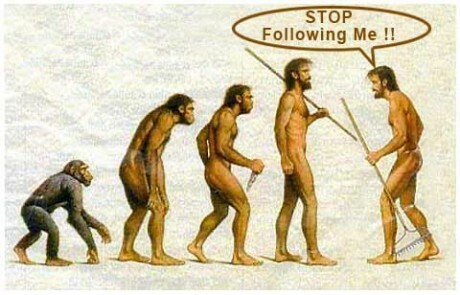 Widely acclaimed as the oldest link between ape and man, much publicity came through the National Geographic Society. But none of the alleged individuals were discovered intact, and some experts suspected that Leakey had a mixture of ape and human material. Also, much of the hand and foot material – claimed to indicate tool making ability and bipedality – was juvenile, making it hard to evaluate. In 1972, Leakey’s son, Richard, found the controversial skull “1470”. Its features and large capacity were “too modern” to fit the mainstream evolutionary scenario, given its alleged age of 2.9 million years. The younger Leakey deliberately reconstructed the skull to give it a more transitional “ape-like” look, and less than ten years later (1981), the controversy was more or less settled, as the accepted age had been reduced to 1.9 million years. Skull “1470” was then classified as “Homo habilis”, a win-win move that supposedly boosted the credibility and status of both Leakey’s and their famed fossils. Then came the first discovery of an intact individual in 1986 (an adult). Evolutionists were surprised that it was smaller than its alleged ancestor, Lucy. The consensus now is that the genuine “habilis” was just another “australopithecine ape” that never belonged in the genus Homo, whereas the genuine skull “1470” should be classified as modern man, Homo sapiens. As for the genuine Homo habilis – it never existed. It is now considered to be an “invalid taxon”. 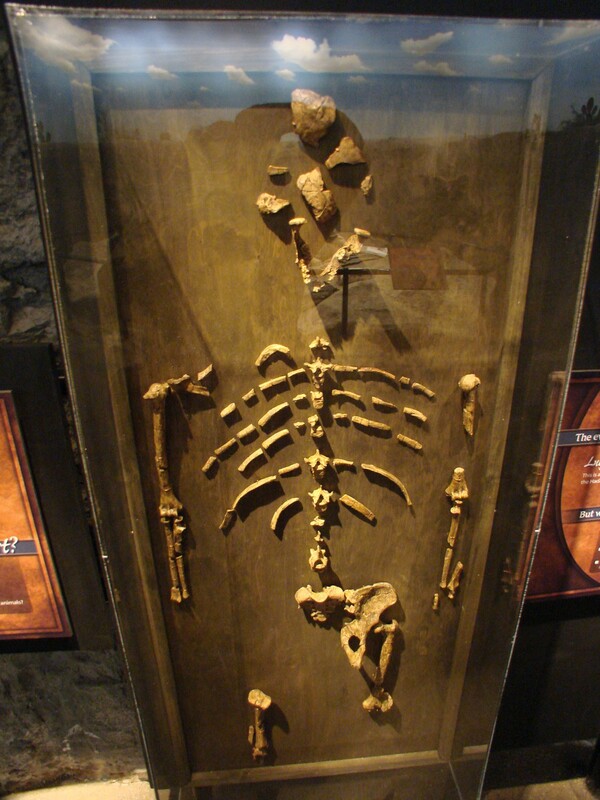 Cast of original “Lucy” fossils on display at Creation Museum. 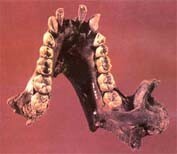 Millions have heard of Lucy, a three-foot tall Australopithecine found by Don Johanson, in Ethiopia, in 1974. Publicized as our oldest direct human ancestor, many still believe that her genes are in all of us. The name “Lucy” comes from the Beatles’ song “Lucy in the Sky with Diamonds”, on a camp loudspeaker when she was found. A very small specimen, Lucy may or may not actually be a female. In either case, the famous fossils remarkably complete (about 40%) accounting for much of the attention she has received. Yet, Lucy’s skull is so incomplete that no firm conclusion can be drawn about her particular species. However, Lucy is not alone. Many Australopithecines like her have been studied extensively. Computer scan analyses of the inner ears, skulls, and bones indicate that these creatures may have walked more upright than most apes, but clearly would have gotten around on all four legs, and very likely spent a lot of time in trees. Lucy was an extinct type of ape, very similar to modern “pygmy chimpanzees” and nothing more. Many leading evolutionists, including Richard Leakey, now share this view. One study, performed in 2000, discovered a locking system in Lucy’s forearms enabling it to walk using the knuckles, in the same way as modern-day chimps. In the face of all these findings, many evolutionist experts declared that Lucy could not have been a forerunner of man. Ramapithecus, like Lucy, was promoted as the most primitive hominid ancestor of modern man, in our direct line of evolutionary descent. Numerous illustrations showed Ramapithecus walking in a nearly human upright manner. Even though the evidence was weak, this view was widely accepted for many years, due largely to the persuasiveness of Harvard University’s David Pilbeam. Later, Pilbeam found additional fossil evidence which made it obvious that this creature could not be the ancestor of humans. “A group of creatures, once thought to be our oldest ancestors may have been firmly bumbed out of the human family tree”. 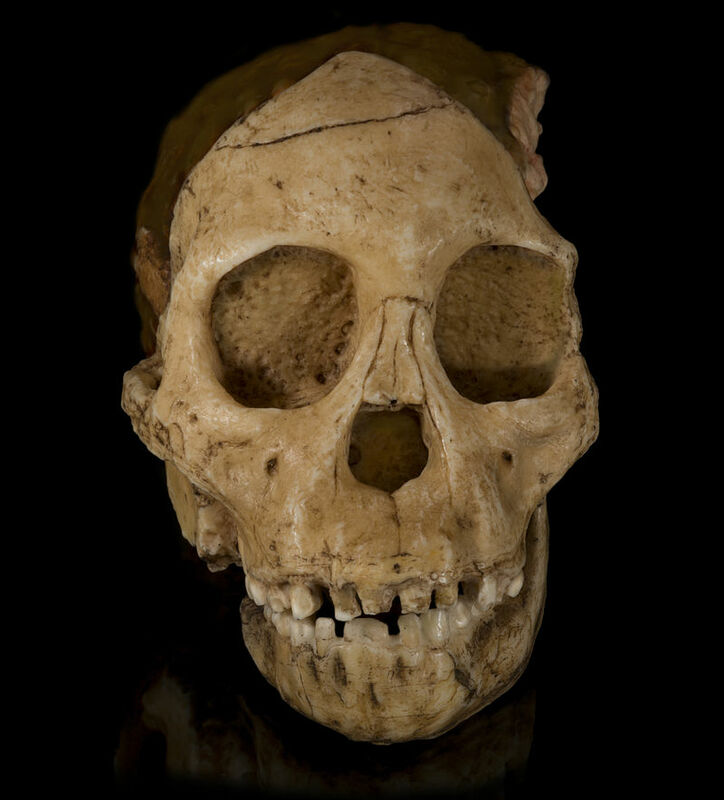 Fossilised skull of a young Australopithecus africanus discovered in 1924, in Taung, South Africa. The Taung Child skull discovered by Raymond Dart in South Africa in 1924 was initially depicted as a supposed ancestor of man. However, contemporary evolutionists can no longer maintain that it represents such an ancestor because it subsequently transpired that the skull belonged to a young gorilla. The famous anatomist Bernard Wood stated that this fossil constitutes no evidence in favor of evolution (in an article published in New Scientist Magazine). We see that some of the alleged evolutionary “ape-men” have been deliberate hoaxes. Others have been simply cases of poor science, often motivated by overzealous and wishful thinking. We do observe evidence in the fossil record of natural variability within the ape and human populations, and a grim chronicle of disease, suffering and death. In every case, however, the bottom line is the same: There is no fossil evidence of “ape–to–man” human evolution. Darwin’s thesis that human beings and apes are descended from a common ancestor was never supported by any scientific findings, neither when he first proposed it, not afterward. All the efforts exerted from then to the present (a period of some 150 years) have been in vain. All the fossils obtained to date have proved that apes have always existed as apes, that human beings have always existed as human beings, and that apes did not turn into humans. The “missing links” are still missing. They are non-existent because they never existed in the first place. Darwin was sure they existed but couldn’t find one, blaming the geological record.